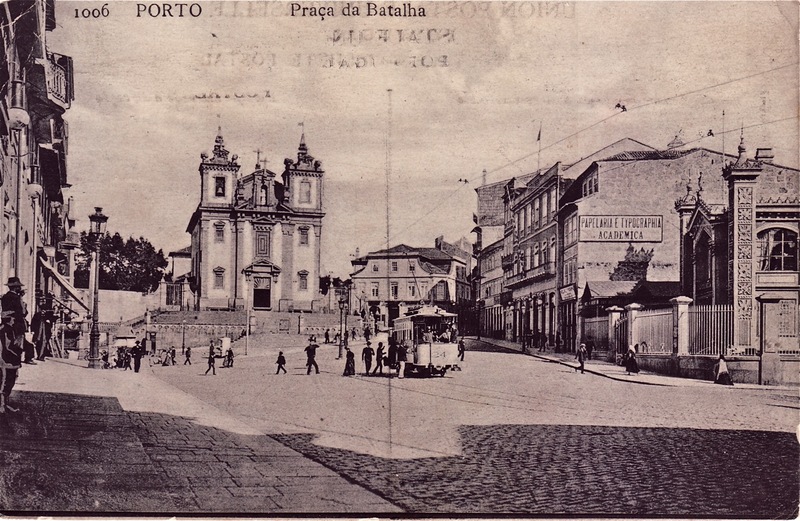 The church at the right is the Igreja do Carmo. It was build in the period 1756-1768. 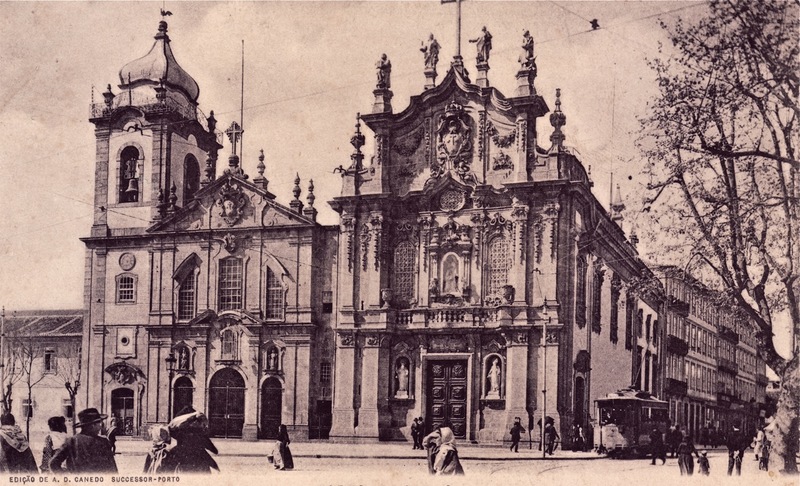 The church at the left is the Igreja dos Carmelitas, build in the period 1616 to 1628. At the right is electric tram no.4. This tram originates from a mule tram and was electrified in 1896. 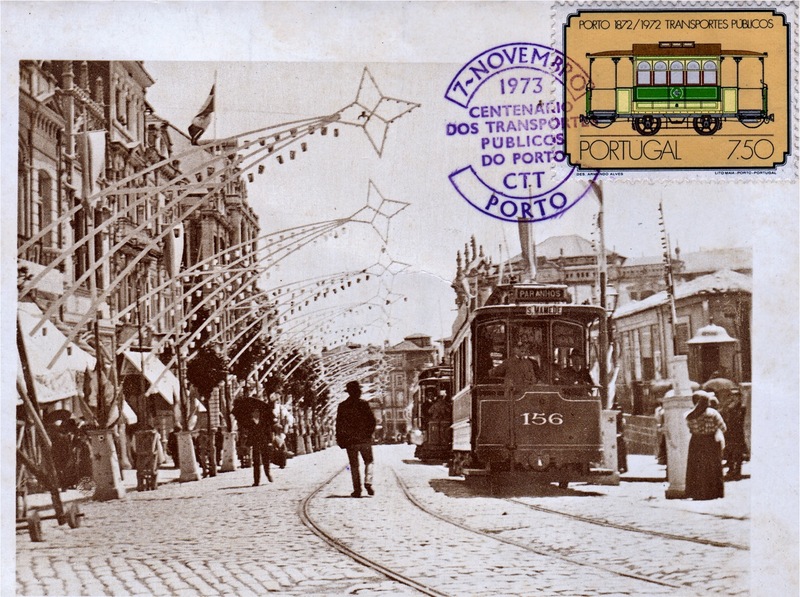 This postcard is a reprint to celebrate the 100 years of existence on trams in Porto. It shows an open mule tram with longitudinal benches. A pole with overhead wires is already visible, which proves that the photo was taken in or around 1900. 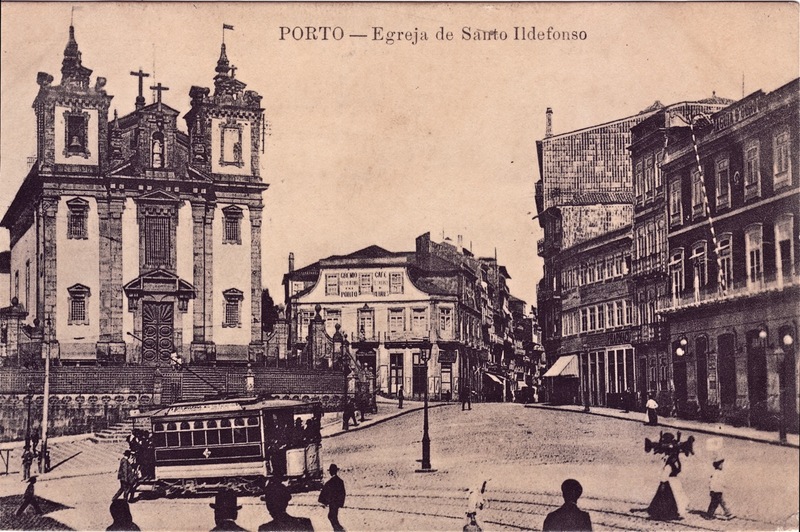 This is a reprint to celebrate the 100 year of existence of trams in Porto. The original photo shows tram 156. This tram was one of two, numbered 33 and 34, likely build in late 1901 or early 1902 by the local firm A Constructora using trucks and electric equipments from Schuckert & co. There was in november 1902 a runaway incident with tramcar 34 and the reliability of the brakes of these two tramcars was questioned. It seems both trams went out if service, got new electric equipments and entered service again in 1904, now numbered 55 and 56. In 1907 the fleet numbers were raised by 100. The tram shows São Mamede, but not a line number. This means the photo was taken in 1910 or 1911. In the background is tramcar 32 visible. This tram was in 1901 or 1902 converted from a mule tram into an electric tram. 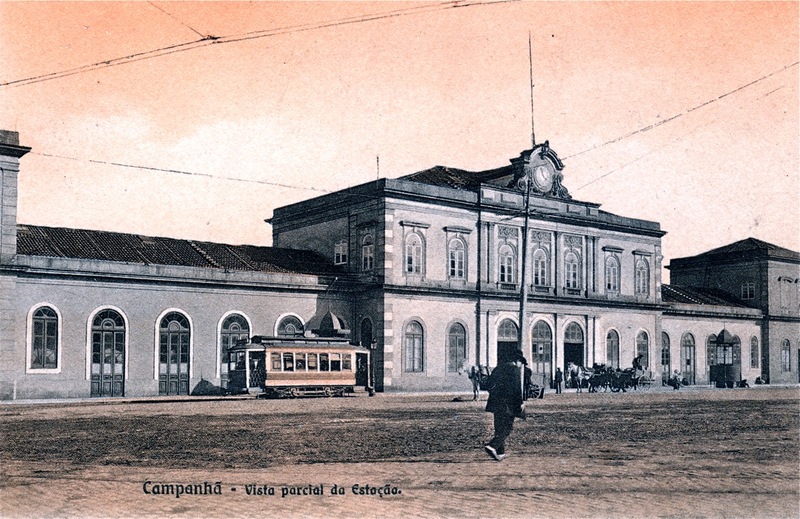 This postcard shows the Campanhã railway station with in front a Brill tram of the 1909 order. The tram seem to have not yet a route number, which dates the photo to 1910 or 1911. 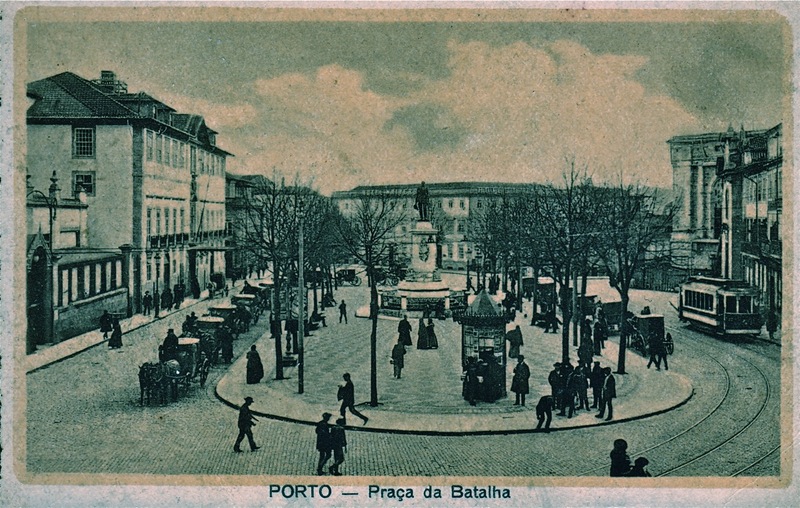 On this postcard a Brill tram is visible working on the short living line B Campanhã – São Lazaro – Batalha – Praça da Liberdade – Carmo – Carvalhosa – Boavista – Bessa. This line existed from 1 january 1912 until november 1914. At the right is an electric tram of likely the 8-window former mule tramcar type. It has a second trolley-pole and the line number 13 can be seen, which means it’s on the way to VN de Gaia. The presence of the line number proves that the photo is taken after 1 january 1912. As the postcard is dated 21 january 1915, the photo must be taken some time before that date. The tramcars 33 and 34 were build late 1901 or early 1902 by the local firm A Constructora and received trucks and electric equipments of Schuckert & co. Their bodies were similar to the in 1901 build 24-25 and the 1903 build 38-39. These bodies were probably copies of a the one of a tram delivered in 1898 by Schuckert & co. However the 24-25 had electric equipments of Siemens & Halske and the 38-39 of Walker. 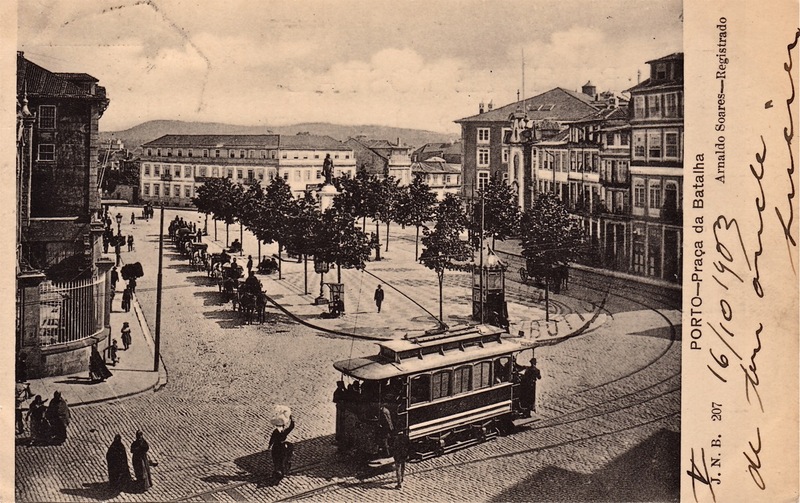 Tramcar 34 was involved in a runaway incident in Rua Santo António (now Rua 31 de Janeiro) in november 1902. This incident caused doubts about their braking capacity and trams with the numbers 33 and 34 were not used anymore. In 1904 two trams of this type appeared with the numbers 55-56. These were likely the former 33-34, but with new electric equipments. Later the window arrangement of these trams was changed to six windows at each side without changing the dimensions of the body. They also got closed platforms. Likely at least one was perished in the Boavista fire of 1928. Two trams of this type were still used by the STCP, mainly on minor lines. They had the numbers 102-103. 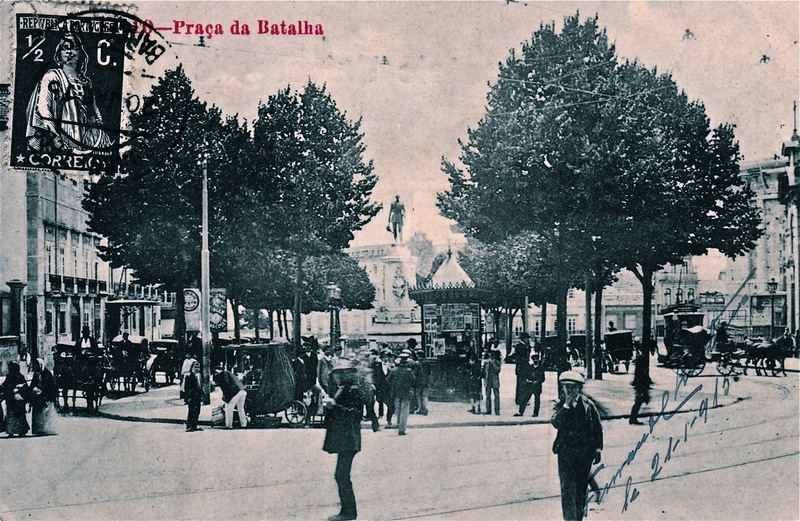 Praça da Batalha with an electric tram converted from a mule tram. 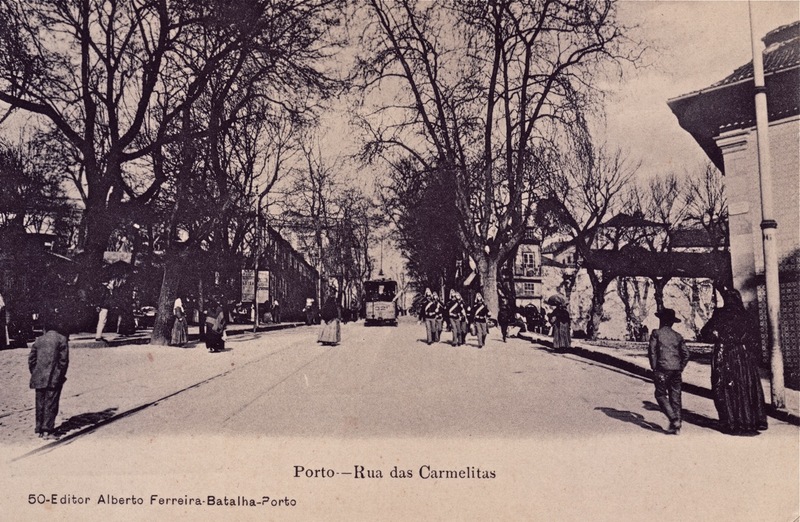 The mule tram likely originated from the Companhia Carril Americano do Porto á Foz e Matosinhos. The tramcar was likely converted in 1902 or 1903 and later renumbered from 35 to 24. This postcard shows an electric tram converted from an old mule tram. 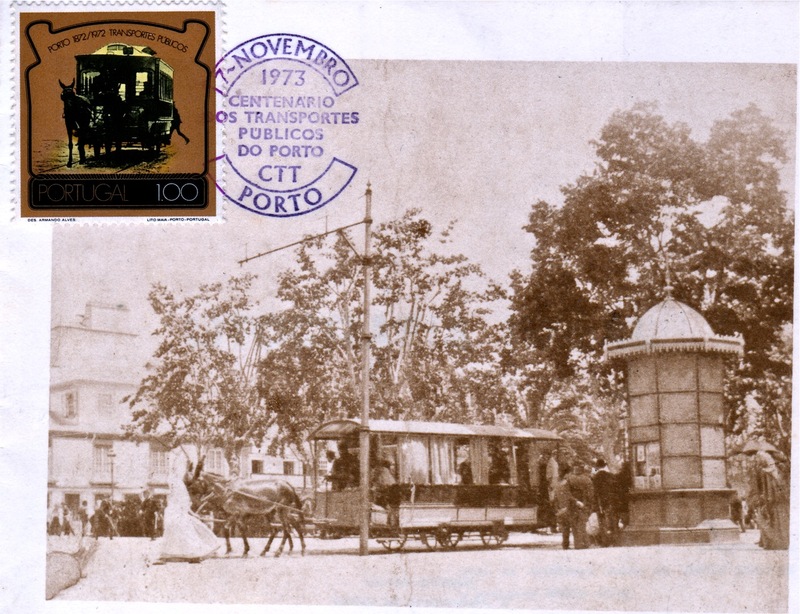 The mule tram was likely build for the Companhia de Carris Américano do Porto á Foz e Matosinhos in the early 1870’s. In 1903 it was electrified and got the number 37.